Learn to Make Kiso Valley’s Unique Salt-free Pickling Technique. Japanese pickles ("tsukemono") play a large role in Nagano's cuisine. One of the specialty "tsukemono" of the Kiso Valley is called "sunki". It's made from turnip greens and is fermented using lactic acid bacteria (like in yoghurt) instead of salt like most tsukemono use. At the Furusato Taikenkan activities hall in Kiso Fukushima, you can learn how to make "sunki" yourself. Being so far from the ocean, salt used to a luxury item in the Kiso Valley. Perhaps that's the reason why "sunki" was developed here. 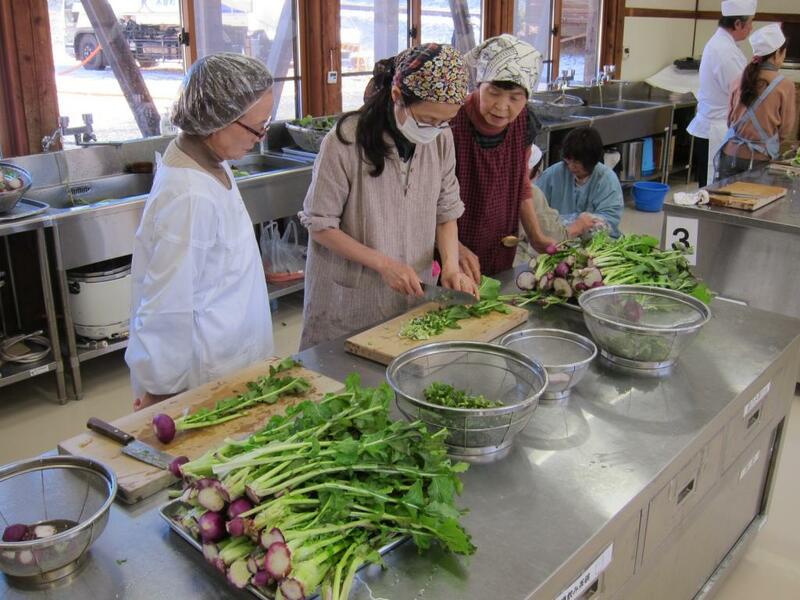 "Sunki" is unusual in that salt isn't used in the fermenting process of the turnip greens. Instead, lactic acid bacteria is used (lacto-fermenting), giving "sunki" a sour flavor not unlike that of yoghurt. It's a very unique type of tsukemono, and has been proven to have many healthy attributes. The Furusato Taikenkan in Kiso Fukushima is an activities center that puts on a variety of cooking lessons, including "sunki". So for you foodies out there that want to experience making Kiso Valley's rare type of tsukemono, don't miss this opportunity! From Kiso Fukushima Station (JR Chuo Line), Take bus bound for Kaida Kogen (15 min.). From Ina IC, 45 min. Tsutaya in Kiso-Fukushima : Relaxing Hotel Awash in the History of the Old Kiso Road. Oyado Iseya in Narai-Juku : Friendly Service and Delicious Kiso Home Cooking. Awanoyu in Shirahone Onsen : Relax in Awanoyu's Milky White Mineral Water in Famous Shirahone Onsen. Yumoto Saito-Ryokan in Shirahone : Grand, historical ryokan featuring Shirahone’s unique milky-white onsen water. Soba Tokkuriya : Handmade Japanese Cuisine in and Edo-era Post Town. Master Gohei Mochi Making : Make Kiso’s Specialty Mochi-rice Sweats. Make Chopsticks out of Hinoki : Use Kiso’s Famed Hinoki Wood to Make Your Own Pair of Chopsticks. Nanawarai Sake Brewery Tour : Tour the Nanawarai’s Sake Brewery, the Pride of Kiso Valley. Soba-Uchi (Making Buckwheat Noodles) at Soba Mecca Kaida Kogen : Make Soba Noodles by Hand in Kaida Kogen, Buckwheat Paradise at Mt. Ontake.